If you had to choose one word to describe Absinthe, it would have to be "rich". The cozy interior is flush with murals and deep crimson walls accented with Belle Epoque art and vibrant French absinthe posters, creating a warm and inviting ambiance with a rich patina of glamour. The menu blends upscale French bistro fare with New American-influenced French and Northern Italian entrees. From couples to small parties and even a few children, everyone seems to be having a good time here, whether just enjoying a few expert cocktails, grabbing a pre- or post-opera meal, or indulging in a three-course dinner. Executive chef Jamie Lauren has been with the restaurant since mid-2007. After making a name for herself at Levende Lounge, it was anticipated that Lauren would become the chef at Prana. But after permit issues and delays of more than a year, Lauren took the top spot at Absinthe and never looked back. Taking over from Ross Brown, the original chef, she has elevated the cuisine and taken it to a new level. 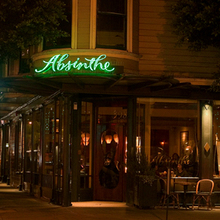 Since it opened, Absinthe has been known for brasserie standards such as French onion soup, a giant croque monsieur, pommes frites, artisan cheeses, charcuterie and oysters, as well as an excellent "fancy restaurant" hamburger. While weightier, traditional dishes like cassoulet seem to have gone the way of the dodo, most of the starters and sandwiches of yore are still available on the bar menu. Meanwhile, Lauren has incorporated more local and organic ingredients as well as a more seasonal approach to the dinner menu, which will be welcome to longtime regulars who liked the old menu, but thought it both heavy and a tad stale. Diehards may mourn the coq au vin, however. We began a recent meal with a special on the raw menu, a crudo of scallops served with a whole grain mustard celery salad. The five large chunks of scallop were perfect for sharing. So too were a dish of spicy, crispy chickpeas ($4), which also make a great bar snack. The thin, crisp French fries ($6) are just what you'd expect to find someone munching at a sidewalk table in Paris. If the flatbread with melted leeks and goat cheese ($15) is any indication of the quality of the pizza found on the bar menu, I wouldn't hesitate to order it. Both chewy and crispy, the gooey leeks and cheese are balanced with a fresh and bright topping of mizuna greens. My favorite entrees: braised beef cheeks with smashed potatoes, roasted baby vegetables, and Brussels sprouts ($26); and a pork confit with braised red cabbage, Serrano ham, and crispy mustard spätzle ($24). The beef is braised to a meltingly tender texture and accented by hearty, fresh carrots and peas. The pork is served with apples and spiced, succulent cabbage; the spätzle is chewy and slightly crispy as well. We found a chicken breast entree to be tender and flavorful, but a bit salty. Though delicious, a side of caramelized Brussels sprouts ($8), laced with bacon and sautéed onion is possibly too robust to accompany the strongly flavored entrees. In any case, we were pleased with the abundance of vegetables that came with every entree, and the very substantial servings. Across the board, desserts are tremendously satisfying. Our top pick, a bright and juicy pomegranate sorbet, was large enough to share and had no iciness. A topping of fresh pomegranate seeds and persimmon provided a bright punctuation to a rich meal.